Well, sort of a little one at least and not wet. Maybe just a dry gulley? Anyway, the tile project is DONE! They came on Tuesday and finished on Friday. All remodels should last but one week don't you think? For a chuckle, this is the little island we traded our big one in for. Without further babbling, here is the project from start to beauty shot. While grout and cement waged war on the floor downstairs, I did get a wee bit of sewing done. 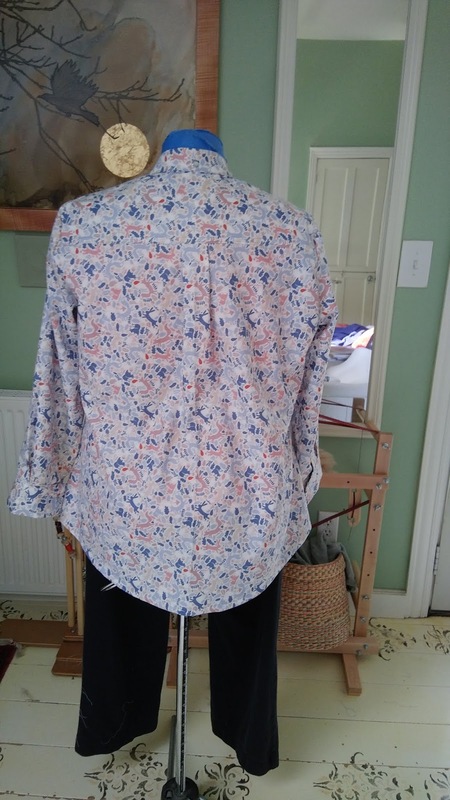 The last of my cut out Hey June Cheyenne shirts. In fact I need to get cutting. 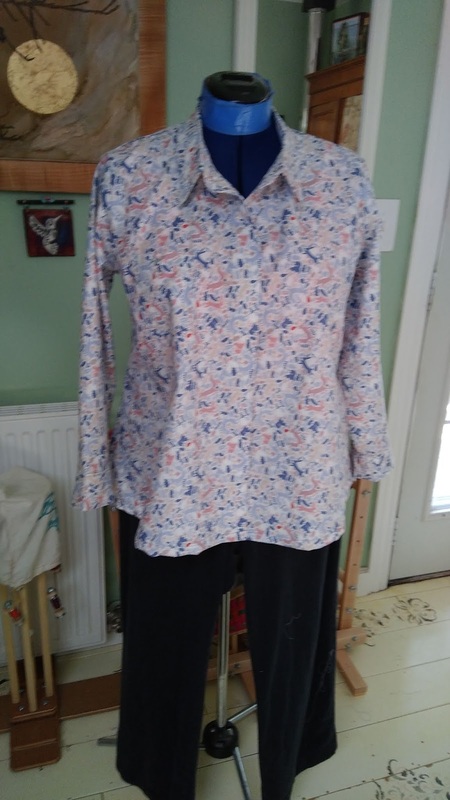 Try out the Liesl & Me shirt pattern, do the rest of the scrub tops now that all the other sizes of top have been traced and cut out on Swedish tracing paper. A pain I might add. I am worlds laziest person when it comes to patterns. I cut mine out. I'm also going to try a simple kimono type jacket. I picked up some lovely wool crepe fabric for a song and would like to have at least one pretty little jacket to throw on in the fall. Look at this lovely little spindle that friend Michelle selected for me from Wanda Jenkins. It's a Jenkins Aegean model done in a beautiful Big Leaf Maple. Michelle included some sumptuous fiber too, Shetland from one of her flock, Vienna. 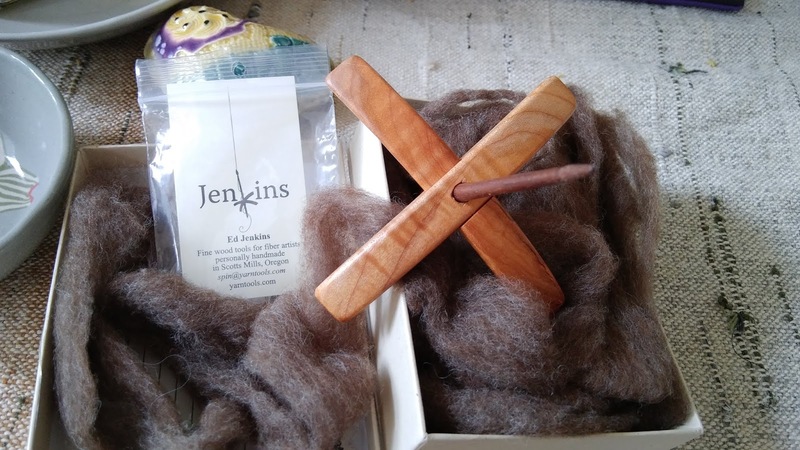 It is lovely to spin even for this spindle novice. Thank you so much Michelle, you may have started another little fiber obsession! 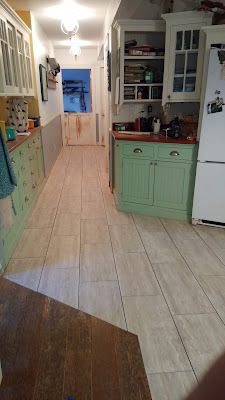 Since the 25 boxes of tile had been taking up critical space in my back weaving studio, once gone I went to town rearranging. I like the set-up much better. Buttercup and Sheila work nicely together. The old mid century modern dresser friend Mary gave me before she abandoned us for Arizona is perfect for holding some specialty yarns, rag fabrics and weaving bits and bobs that needed a place to call home. Still a little more organizing but pretty much done. 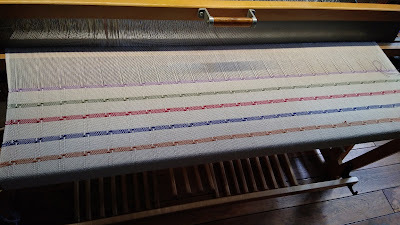 Speaking of Buttercup, her place mat warp is off and a new rug warp is being measured to go on sometime this week. These rugs will be for me I think. 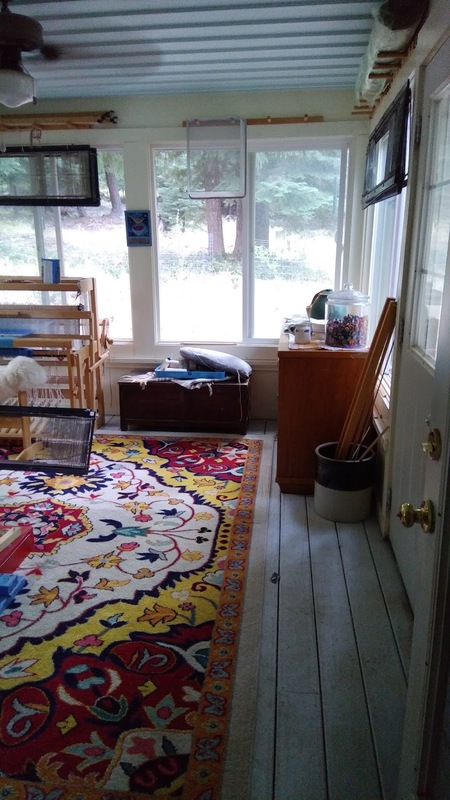 I could use a few small rag rugs here and there. 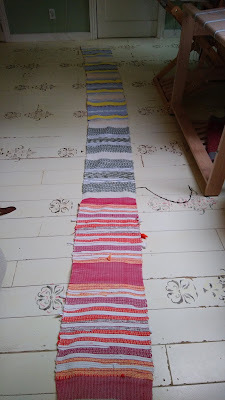 And here is a quick blanket shot of all the stripes. I'm well into the center body of the blanket which is done, of course, all in natural. Parting shot:A Photo bombing Jack! Dibs on the first comment! The tile looks great! I know you've got to be happy that project is finished. Jack! 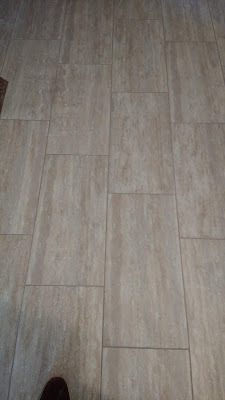 Love the new tile, it looks fantastic. Clean up around your place will be a breeze. Theresa, I have been admiring your kitchen, I love the look and the colors. Thank you! I'm thrilled it is done. The company did a nice job and right on time. LOL! yes, JACK! I'll find out tomorrow about the clean up since it is cleaning day. Needs it too, I bypass bothering last week. The floor is just gorgeous! And so is that blanket! What are the two red boxes on the sides of Buttercup's treadles? 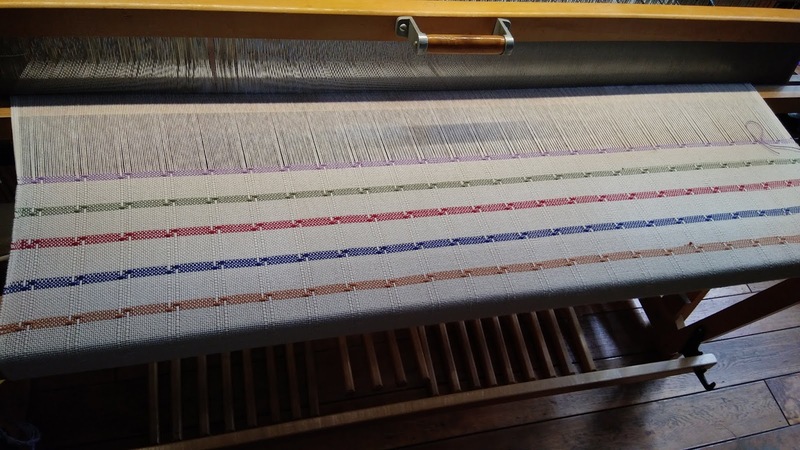 Something to help you when you're treadling it? 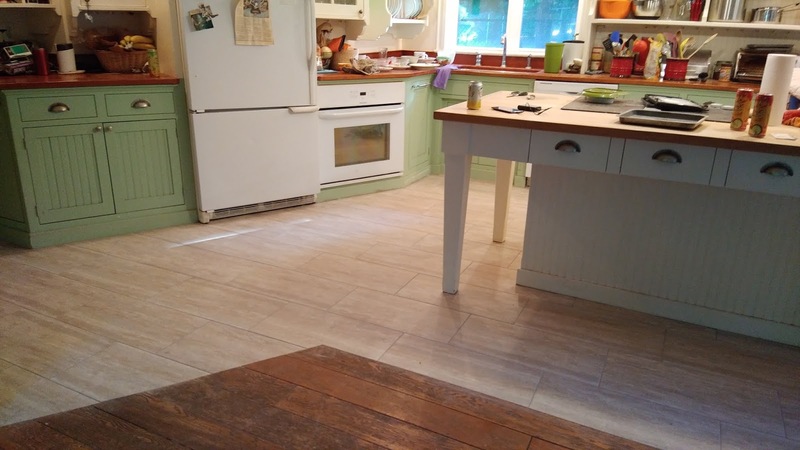 What a fantastic difference those tiles make! Good choice. But you must have gone crazy waiting for them to finish and clear out your weaving studio! New floor...new spindle....new tops! It's a winner!!! 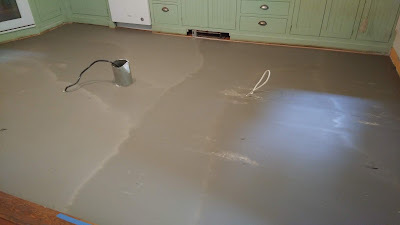 I can just hear those toenails tip, tip, tipping on that tile! I know you're happy that the job is finished!!!! 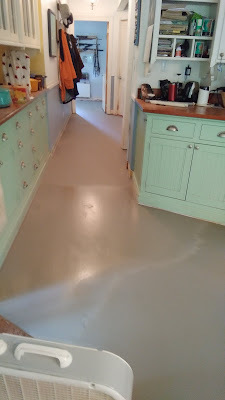 Your kitchen looks fabulous! 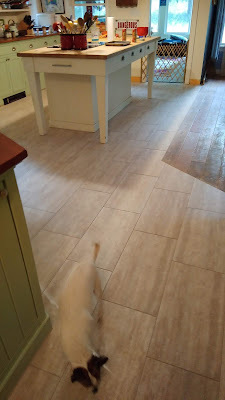 I have tile floors and dogs, so I predict you will love them. Just don't drop anything breakable on them! All your projects fill me with envy. 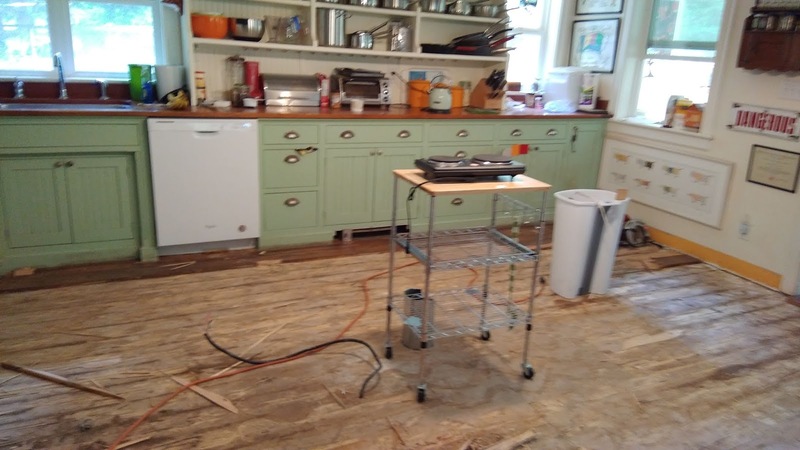 I am not that productive, especially during renovations! And thanks for the song today. After this weekend, I needed it more than ever. Yes, everybody, VOTE! Wow, it looks fabulous! And that spindle is beautiful. That is just what you need - another fiber obsession! I love the look of your loom room - my mood would brighten every time I stepped in there. 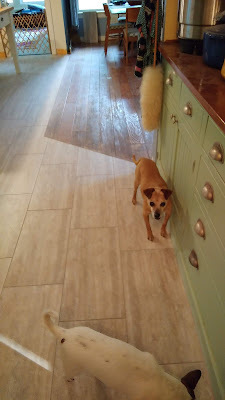 Such adorable dogs - I love terriers. Thank you! Doesn't hold a candle to your lovely old place though. I just loved Pete Seeger! But his hat was pretty darn cool. Thank you! 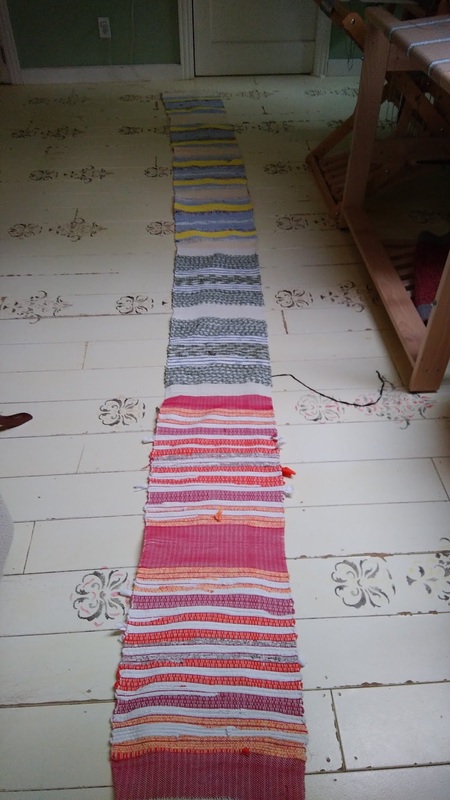 I'm rather smitten with the floor, the blanket and Mongo the loom, myself. The boxes are were you can rest the foot that isn't depressing a treadle. It's quite comfortable and gives a place even with the treadles but allowing the shafts to be completely neutral . I am loving those tiles. I wish I could have done the whole downstairs. Wood floors are nice but tile floors are much more practical with as many dogs as we have. Very happy! Isn't that spindle lovely! I hope my spindling gets better to do it justice. Susan, That whole back room is a beautiful place to be. 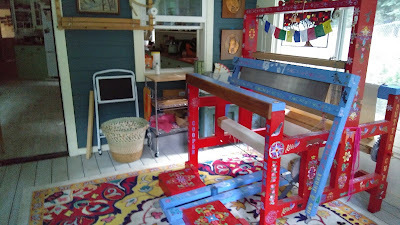 I love the hand painted loom more than I can say and yes, I smile every time I even glance in there. Now you know, terriers are rotten little beasts. I wonder why I love them so much. I think Doxies have more than their fair share of terrier and that goes for Chihuahua's too! It's beautiful! Now pick up a wet vac tile floor cleaner and your life will be perfect! 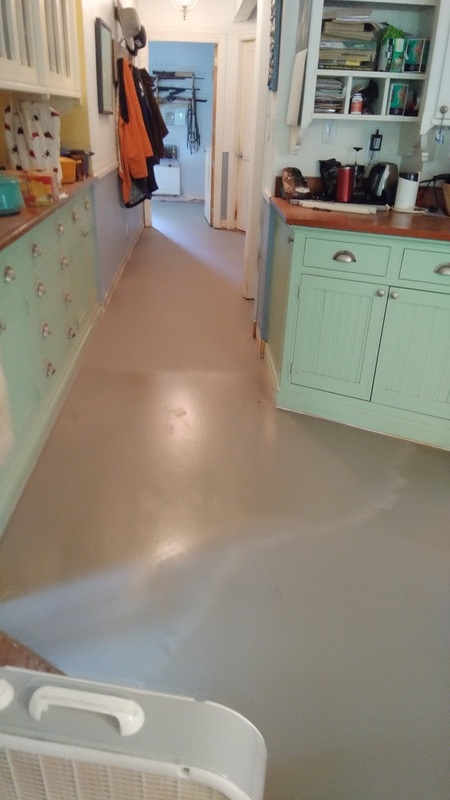 What a beautiful result on that floor...so clean and modern and probably a dream to clean as well! 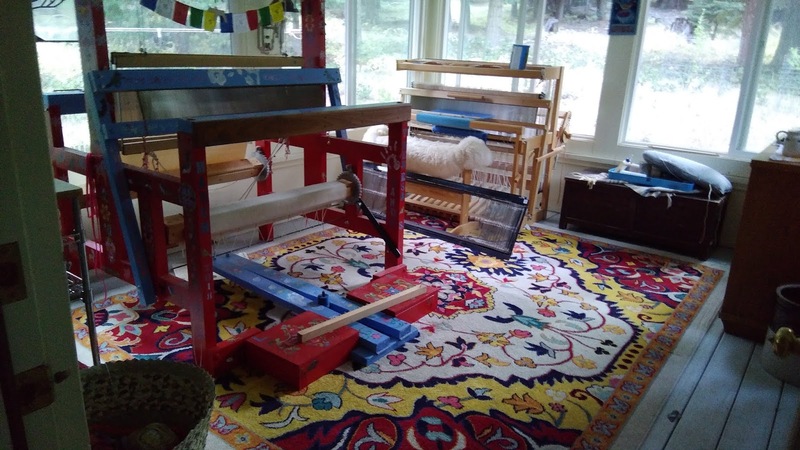 I am always so envious when i see photos of your colorful rug under the loom!! !